Modern lacrosse has its origins in the stickball games played by a number of Native American communities in North America. These games were played as early as the 1600s, mostly in the land that would become the Southern United States, the Great Lakes region, the Mid-Atlantic states, and throughout Canada. Unlike today’s lacrosse, which only has ten players per team, the original version of the game featured hundreds of participants. A match would begin by tossing a ball in the air, and the mobs of athletes on each team would rush to catch it with their sticks. With so many players on the field at once, the ball moved rather slowly across the pitch, which could range anywhere from 500 yards to 6 miles. It was considered cowardly to dodge an opponent, so passing the ball was frowned upon. 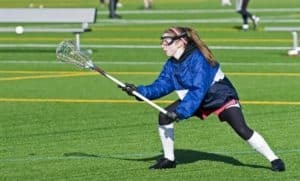 Traditional lacrosse games could carry on for several days! Lacrosse was more than just a sport for Native American communities; it served a number of important societal functions. It could be used to settle disputes between tribes, to train young men for war, or to collectively pray for something. Rituals were a big part of preparing for lacrosse games and could include covering the body in paint and charcoal, dunking the lacrosse sticks in water, and receiving advice from a medicine man. Wagers would be placed by the players, with everything from trinkets and handkerchiefs, to wives and children put up as bets. It was the French missionary Jean de Brébeuf who first used the term “lacrosse” to refer to a game he witnessed in 1636 in the St. Lawrence Valley. Brébeuf may have derived the name from the French phrase for field hockey, “le jeu de la crosse”. Another theory is that Brébeuf was inspired by the “crosier”, a staff carried by bishops. Along with ice hockey, lacrosse is officially designated as Canada’s national sport. It was our neighbors to the north who adapted the game from its indigenous origins to create the modern pastime enjoyed around the world today. William George Beers, a Canadian dentist, was an important figure in the history of lacrosse. Beers was responsible for shortening the length of the game, redesigning the equipment, and reducing the number of players when he founded the Montreal Lacrosse Club in the mid 1800s. Rocky Top Sports World is a wonderful place to host a lacrosse tournament. Located in the foothills of the Great Smoky Mountains in Gatlinburg, TN, our 80 acre sports campus offers breathtaking views and state-of-the-art facilities. Athletes will enjoy six synthetic turf fields, one championship field with a press box and seating for 1,500 people, and an onsite grill. To learn more about our complex, visit the Rocky Top Sports World Facilities page! This entry was posted in Trends in Youth Sports on September 19, 2016 by Jason Fishman. Previous PostYouth Sports Tourism Becomes Fastest-Growing Part of Travel IndustryNext PostWhy Do We Play Football on Thanksgiving?